Our first seminar will be devoted to an examination of the Très riches heures. Like many Books of Hours, the Très riches heures was made especially for its original owner: John of Berry, the son of King John the Good of France, the brother of King Charles V, and the uncle of King Charles VI. He was thus one of the most powerful and wealthy men in France. His status is reflected in the luxury objects like the Très riches heures that he acquired. We should pay attention to the contradictory motivations in acquiring this manuscript: object of Christian piety and use as a symbol of status. As we will see when we examine the manuscript in detail, it is hard to miss the sense of pride. 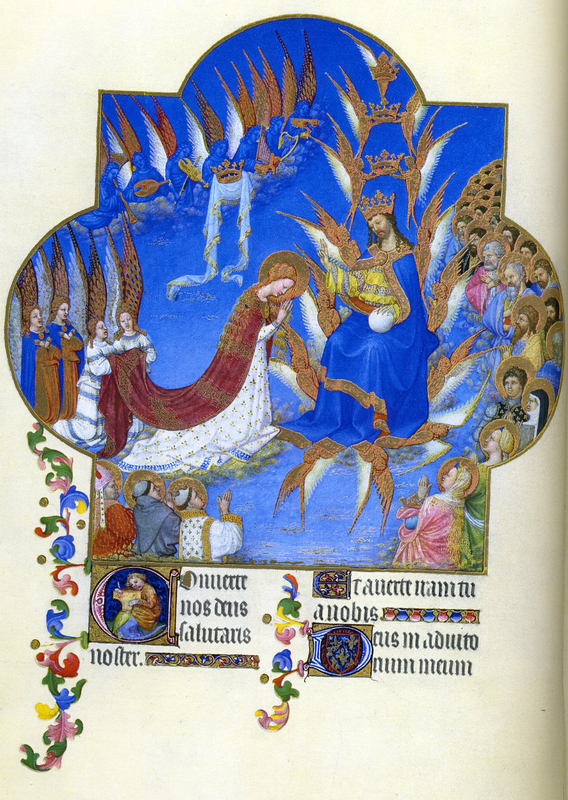 The Très riches heures' fame is due to the extraordinary series of miniatures decorating the manuscript. 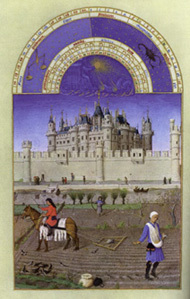 These pictures were the work of the so-called Limbourg brothers. Traditional scholarship has emphasized the extraordinary "naturalism" of the paintings. The sense of illusionistic space and attention to light are unprecedented at this period. The attention to detail derived from observation of the world is evident in the snowscape of the February page or the cast shadows found in the miniature accompanying October. 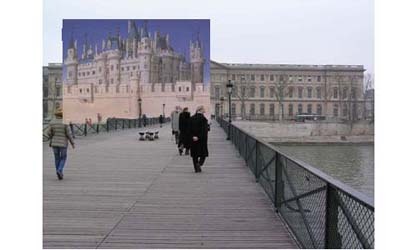 The representation of the Louvre in the background of the October page has been a crucial document in the reconstruction of the early form of this important building. Just about every miniature includes details derived from empirical obervation of the world. This "naturalism" lends a veracity to these miniatures. The paintings tempt us to view them as neutral or transparent records of the fifteenth century. As the most recent scholarly study of the manuscript has emphasized, the "scenes are constructs, and must not be seen, for all their 'realism,' as neutral" (Alexander 438). 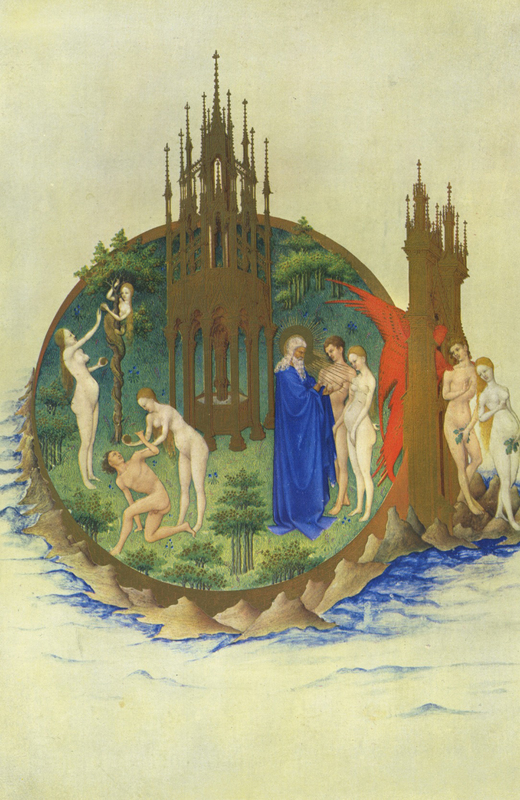 It is more appropriate to understand them as constructs made intentionally by the Limbourg brothers to present the ideology of John of Berry. We will find that the miniatures represent the world as seen from the social and political point of view of Jean de Berry. 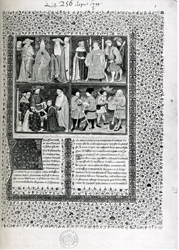 The frontispiece of a copy of Laurent de Premierfait's translation of Boccaccio's Des cas des noble hommes et femmes (Paris, Bibliothèque nationale, fr. 131, f. 1) from about 1415 demonstrates the continuity of this class division. 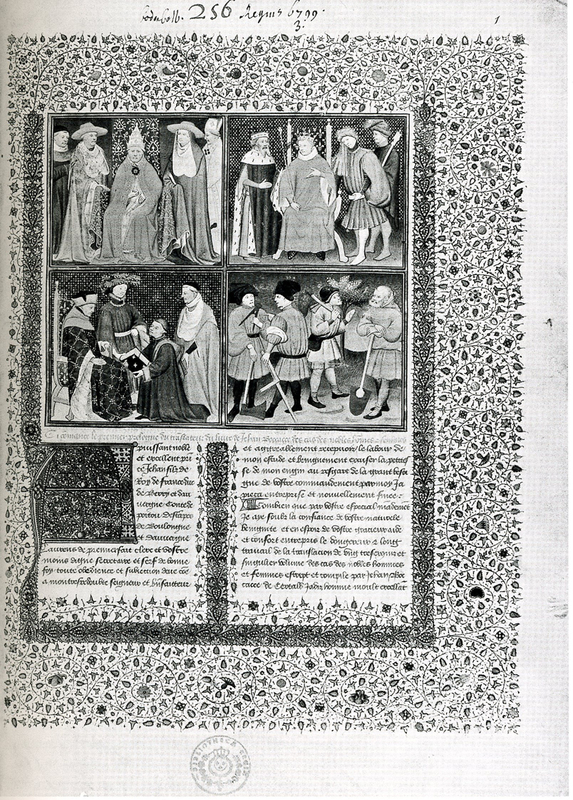 The scene on the top left illustrates the clergy (those who pray) with the Pope seated in the center, and the scene on the top right illustrates the nobility with a group of figures flanking the enthroned French king. The scene on the lower right shows the workers. It is significant that this scene shows a subdivision between the peasant laborers on the right and masons or architects holding the tools of their trade, a square and ruler. Dress provides a key to reading the different social positions of the figures represented. 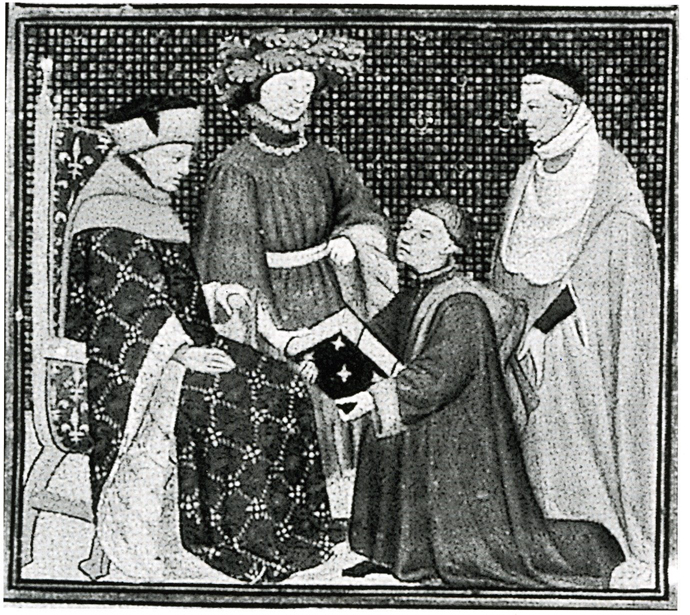 The scene on the lower left illustrates the presentation of the manuscript to Jean de Berry. Laurent de Premierfait kneels humbly before the Duke. It is not clear whether the figure behind Laurent is Boccaccio or Martin Gouge who we know gave the original copy of the text to Jean de Berry on New Years Day of 1411. 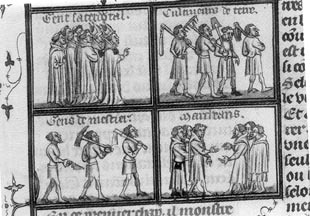 We still see here the fighters (gens darmes), those who pray (gens sacerdotal), and workers (cultiveurs de terre) of traditional feudal society, but added to these are the councillors (gens de conseil), the craftsmen (gens de mestier), and the merchants (marchans). Related to the social division was a profound economic change. For the feudal nobility, one's power was represented by the amount of land owned, while the power of the bourgeois was represented by the amount of money owned. 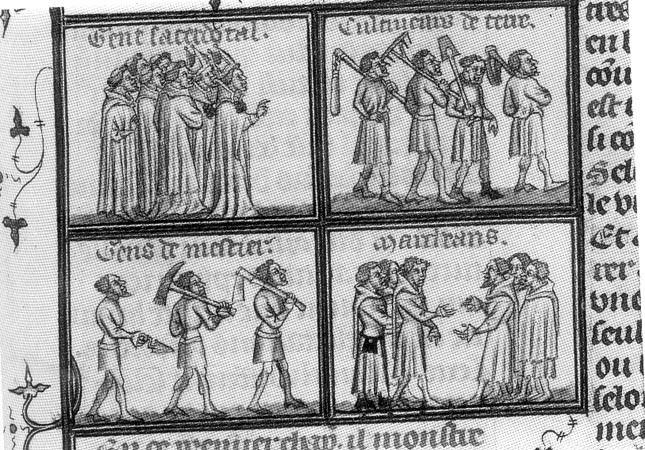 This social tension between the nobility and the bourgeois is a regular theme in courtly literature. In the romances of Chrétien de Troyes (fl. ca. 1165-1190) there is the antithesis between the knights and the despised vilain, or the new bourgeoisie, whose behavior was likened to boors, rabid dogs, despicable slaves, etc. in marked contrast to the courtesy and refined behavior of a knight. This class division will be an important factor to consider in the development of Northern Renaissance art. It is significant that when we apply these social models to our examination of the miniatures of the Très riches heures, we become aware of the absence of any reference to the new bourgeoisie. This is in dramatic contrast to the miniatures that we looked at in the early fourteenth century Life of St. Denis manuscript where we saw the representation of the activities of the cra ftsmen and merchants of Paris. 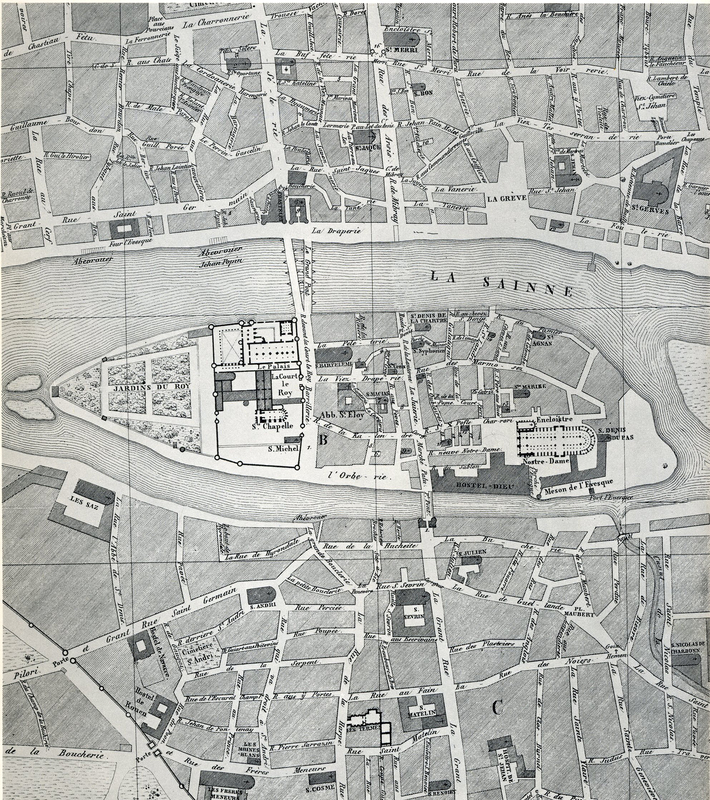 The June and October calendar illustrations show views of Paris from the city house of John of Berry. 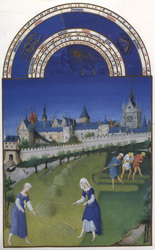 While providing valuable records of the appearance of the Île de la cité and the Louvre at the beginning of the fifteenth century, neither of these miniatures contain any reference to the presence of the bourgeosie in Paris. 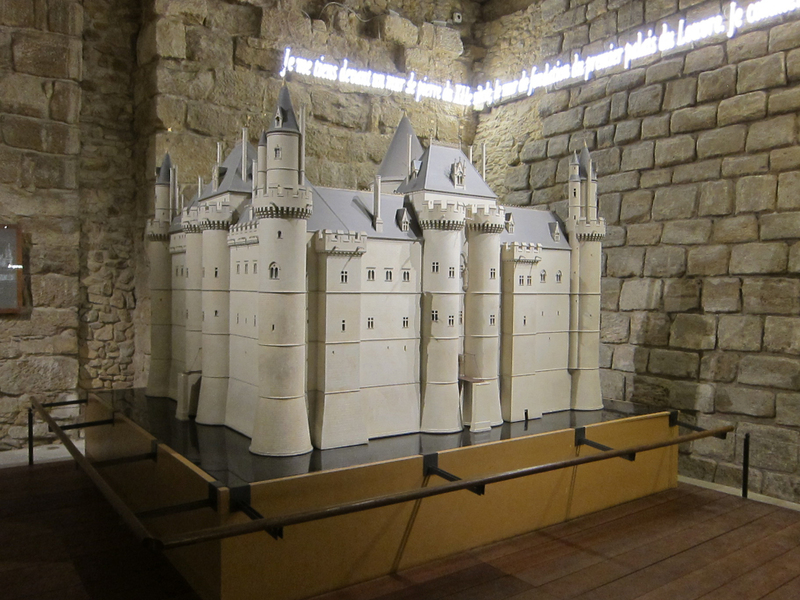 In fact, these miniatures transform Paris into the rural estate of the feudal nobility. Here the peasants are busy tending to the fields in the shadow of their lord's house. 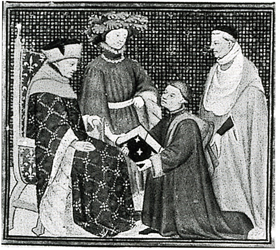 The continued currency of the ideal presented here for the time of John of Berry is suggested by the creation of an edition of Girart de Roussillon in 1447 for the Duke's great nephew, Philip the Good, the Duke of Burgundy. John of Berry and members of his court would have modeled themselves on such an ideal. 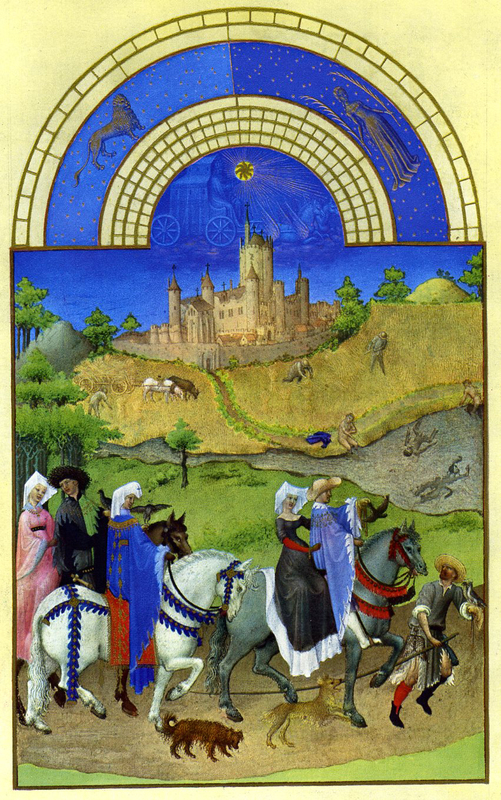 Compare the ideal presented in this passage to the miniatures of the Très riches heures. 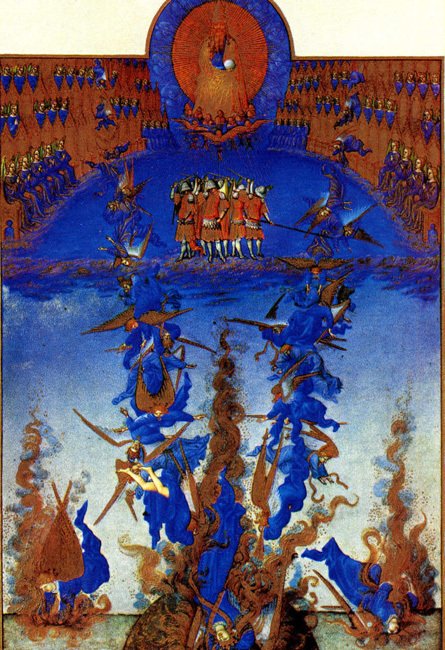 As a demonstration of the importance of this ideology for understanding the miniatures of the Très riches heures consider the miniature of the Fall of the Rebel Angels. As noted above, ties of feudal obligation between a vassal and his liege lord were central to the political and social structure. The breaking of these obligations undermined society and could lead to civil war. 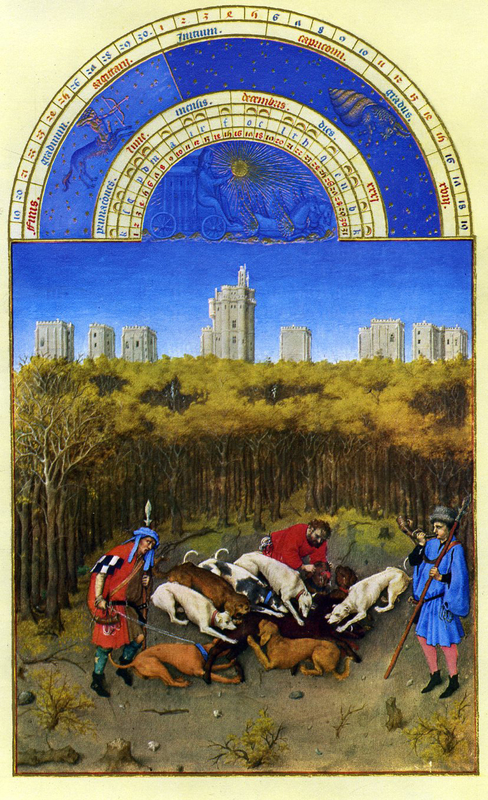 It is against such a political backdrop that the Limbourgs painted the miniatures of the Très riches heures. Under the weak reign of Charles VI as a consequence of his mental illness there was extreme factionalism. This came to a head with the assasination in 1407 of Louis d'Orléans, the brother of the King, by his cousin, John the Fearless, the Duke of Burgundy. For John of Berry the story of Lucifer's disobedience to God gave universal meaning to the ties of feudal of obligation. It is not by chance that the Limbourgs represent the avenging angels as knights carrying out their liege lord's command. Although I would like to look at the manuscript as a whole, we will particularly focus on the calendar sequence. The following annotations are intended to spark your thinking about the miniatures. I would like you to also try to find connections/ parallels to previous discussions and readings introduced in this course. 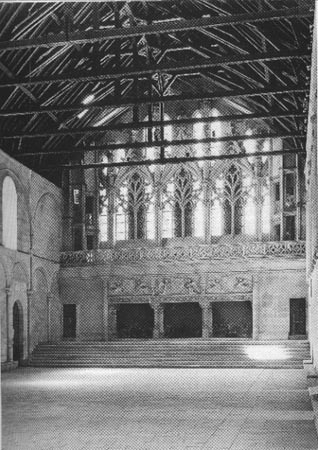 January : John of Berry is shown seated on the right in front of the gold firescreen. To his right stands an usher above whom appears the words "Aproche, aproche" (Approach, approach). Consider the significance of this figure and the words he says in the context of our discussion of court culture. This scene represents the New Year's day feast. Consider from your own experience what is the significance of a feast. Identify different feasts that are a part of your experience. We will have to come to an understanding of what is the significance of this feast in this culture. Consider who is included and who is excluded from this feast and why? Scholars have identified the tapestry decorating the back wall as a representation of the Battle of Troy. Why do you think this is included in the painting? Thus this king, empowered by the world....knew well how to receive nobility, members of the bourgeoisie, and peasants, and extended his courtesy to noble princes and their messengers, when they came to dine, and, according to their nobility, sat at his table. And at these dinners, when high princes were present, and likewise at solemn ceremonies, it was certainly a magnificent things for all people to see: the tableware, the trappings, the noble decorations consisting of gold and silk tapestries worked in fine warp that were hung along these walls in rich chambers (les nobles paremens d'or et de soye ouvrez de haulte lice, qui tendus estoient par ces parois et ces richs chambres), and of velvets embroidered with large pearls, and with gold and silk, with various strange emblems, the ornaments everywhere, hing with these golden draperies, tents, and heavens hanging over these high tables and curtained chairs. "A Jaques Raponde, marchant bourgois de Paris, auquel mon dit seigneur de grace especial a donné la somme de IIIc frans tant pour et en recompensacion d'un livre en françois de pluseurs histoires de femmes de bonne renommee qu'il lui donna aux estraines du jour de l'an derrenierement passé, comme pour les bons services qu'il lui faiz chascun jour et espere que face ou temps avenir, si comme il appert plus a plain par les letres patentes dudit seigneur sur ce faictes, donnees a Paris le XXIe jour de janvier l'an mil CCCC et deux cy rendu avec quictance. Pour ce IIIc frans." 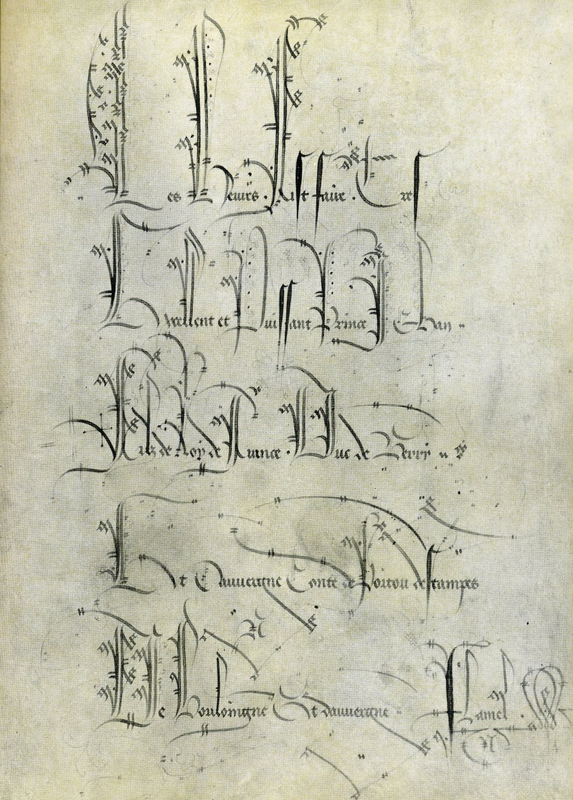 (Dijon, ADCO B1532 f 156r-156v; as quoted in Pierre Cockshaw, "Mentions d'auteurs, de copistes, d'enlumineurs et de libraires dans les comptes généraux de l'état Bourguignon," Scriptorium 23 (1969), 135, no. 49). The wording of this account is worth noting. The 300 francs Philip gave to Rapondi in return was not considered a payment for the book, but the money is seen as a gift in return "for the good services that Rapondi has done for the Duke each day and the hope for this to continue in the future." The exchange is thus a sign of the past and future loyalty between the Duke and Rapondi. 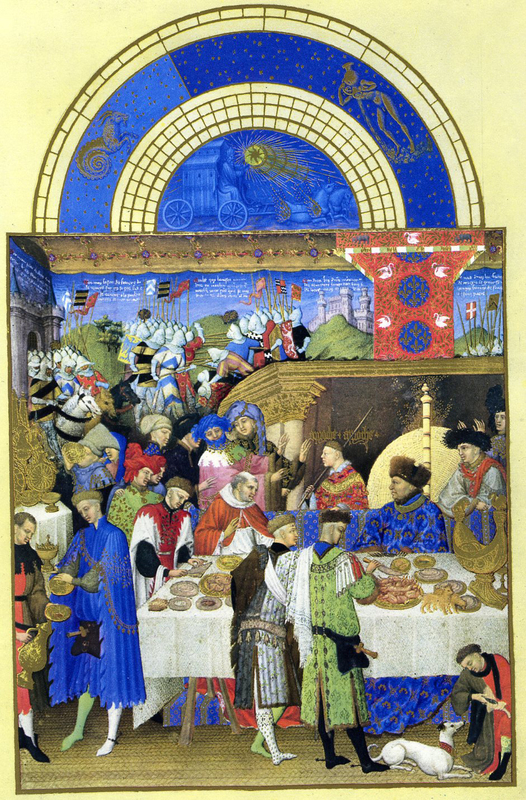 The one religious figure shown in the Calendar of the Très riches heures is the balding, gray haired man dressed in red who is the primary figure conversing with Jean de Berry. The figure is likely Martin Gouge. 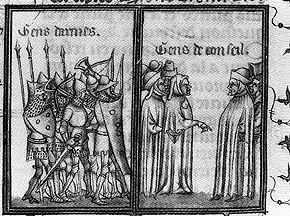 His role as the bishop of Chartres from 1408-15 and bishop of Cleremont starting in 1415 justifies his dress in the miniature, but his close personal and political relationship justifies his presence in the miniature. Martin Gouge was one of the duke's most loyal counselors. He served as the trésorier générale for the Duke of Berry from 1402 until the Duke's death. Through the contact with the duke, he likely gained an introduction to the courts of the King and Dauphin in which he served concurrently with working for the Duke of Berry. Rivaling members of the royal family, Martin Gouge was one of the most active participants in the étrennes celebrations at the court of Jean de Berry. Between 1403 and 1416, there are at least seven times he participated in the ceremonies. His gifts included metalwork, crystal, and especially books. He received in return jewels and books of hours. Appendix 4 of Hedeman's study entitled Translating the Past documents these gift exchanges (pp. 234-238). To the powerful, noble, and excellent Prince John, the son of the king of France, the Duke of Berry and of Auvergne, the Count of Poitou, of Estampes, of Boulogne, and of Auvergne, Laurent de Premierfait, cleric and your least worthyy secretary and servant of good faith and all obedience and subjection give to my very reknowned lord and benefactor and agreeably recipient of the labor of my study and blessedly excuse the smallness of my efforts and to the regard of the great need of our command I undertook and newly finished this enterprise. 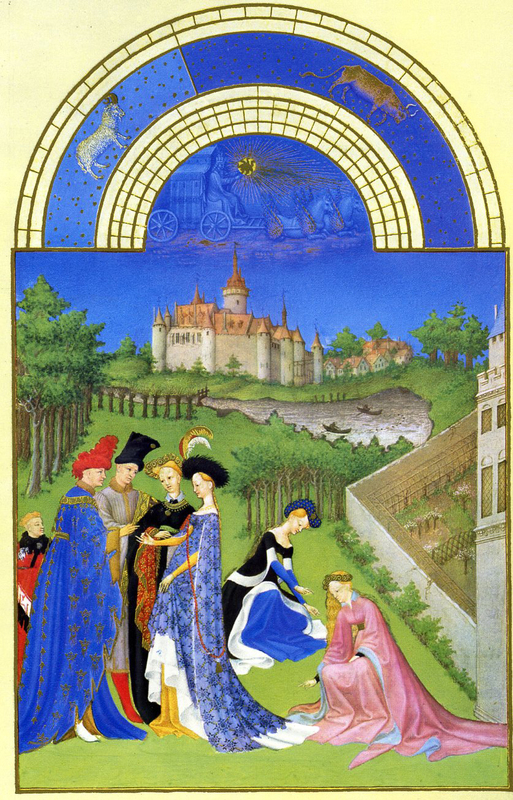 As a creature of court culture, Martin Gouge was a logical individual to be included in the January page by the Limbourg brothers. For further context for the January page see the excerpts from Brigitte Buettner's excellent article on New Year's Gifts at the Valois Courts and particularly her discussion of the January miniature. Like the other calendar pages, astrological and calendrical information along with the symbols of the zodiac appear in the arch above the miniature. Consider the relationship between this and the miniatures beneath. February: Art historians frequently point to the details of this miniature as clear manifestations of the increasing "naturalism" of the art of the period, but I would like to see this miniature as being intentionally compared to the preceding one. Compare them and try to define ideological assumptions implicit in the comparison. 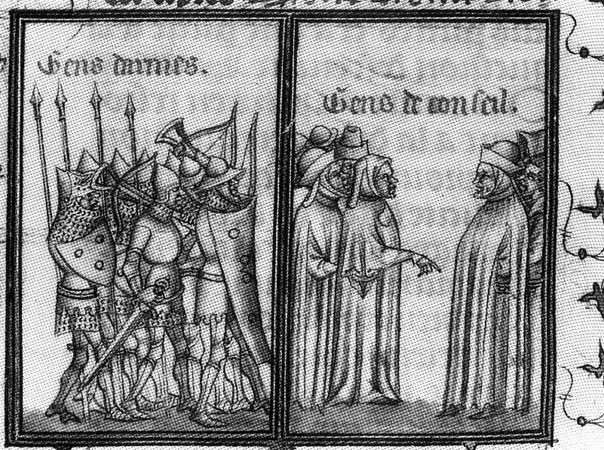 Alexander in his article places this miniature in the context of aristocratic attitudes towards peasants during the later Middle Ages. 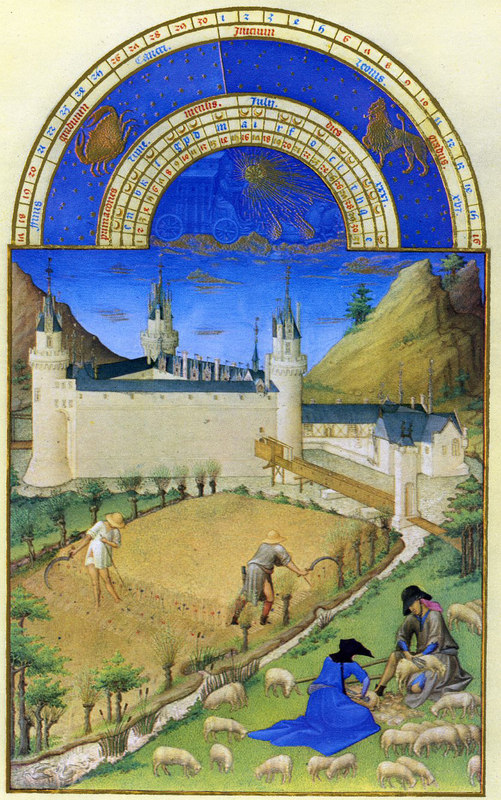 March: In the background of this miniature can be seen one of John of Berry's castles, Lusignan in Poitou (see Google Earth map) We need to explain why the Limbourgs devoted such attention to the representation of buildings associated with John of Berry. 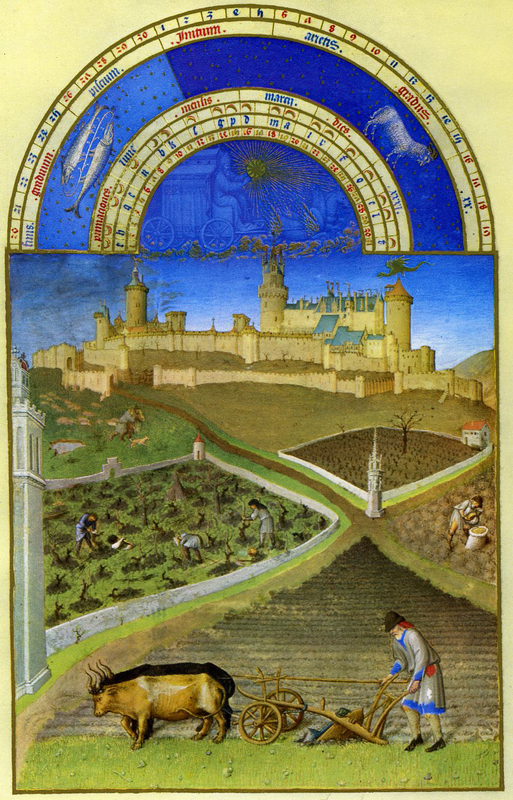 Consider the relationship between the castle and the peasants shown in the foreground of the work. April: This miniature has been identified as an espousal or engagement scene. Scholars still debate about the identities of the couple. Candidates are Jean de Bourbon and Marie de Berry, the second daughter of the Duke who got married in 1400, or Charles d'Orléans and Bonne d'Armagnac, the granddaughter of the Duke, married in 1410. Rather than seeing the image as a representation of a specific betrothal, the image can be seen in the context of the significance of marriage rituals in court culture. Consider why the detail of the enclosed garden has been included on the right hand side of the miniature. In considering the April and May pages, consider the attitudes expressed in the excerpts from Duby's article on Courtly Love. The castle in the background can be identifief as Dourdan. See Google Earth map. May: Represents May Day with a calvacade of nobility out for a ride in the countryside. The buildings in the background represent Paris. We need to consider the social implications of May Day for the aristocracy. In contrast to the April page which represents the formalities around engagement and implies the importance of marriage in the social and political world of the period, the May page focuses on the practices of courtly love. Since the twelfth century courtly love had governed social interaction between aristocratic men and women. A knight was permitted to address a lady who was usually above him in rank and perhaps married --in theory, unattainable. In the elaborate courtship dance that followed, she would be the mistress --not usually in the physical sense-- and he the unswervingly devoted servant. He would wear her favour in the tournament, compose verses in her honour, ply her with gifts imbued with symbolic meaning, or engage in conversations ruch with witty innuendo. Courtly games we a part of courtly love. Blind Man's Bluff, Post and Pillar, Prisoner's Base, shuttlecock, and fortune-telling had hidden codes of their own in the game of courtly love. Every St. Valentine's Eve, each lady of the court would select a partner for the next day, and he was supposed to buy her a gift. Being in love was the fashion, but it was a world away from the realities of the marriage market. 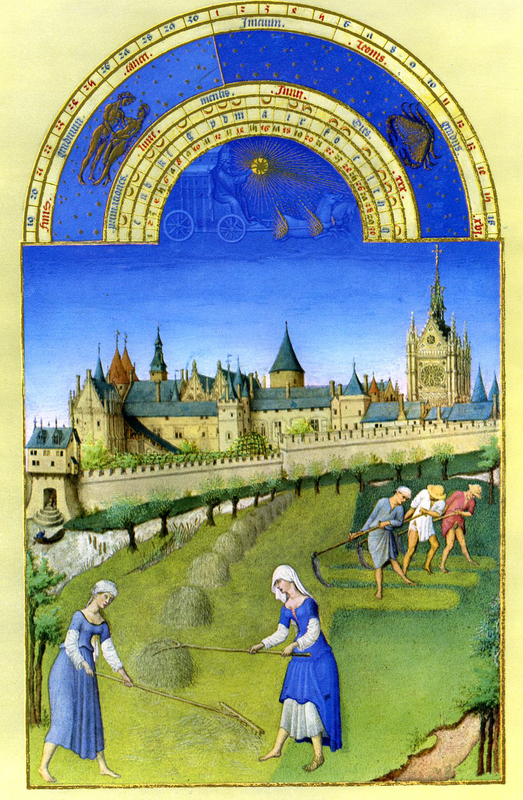 June: In the background of this haymaking scene can be seen the Ile de la Cité in Paris. 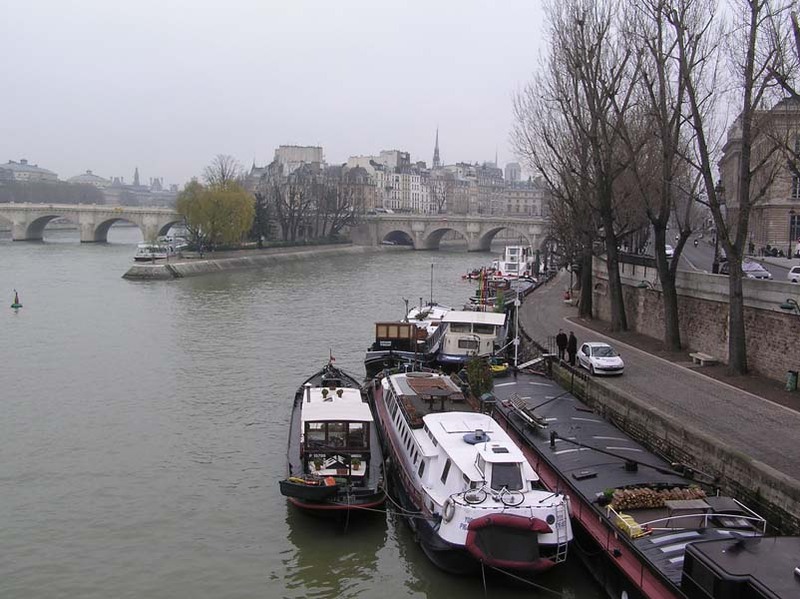 This island in the Seine is the heart of Paris. 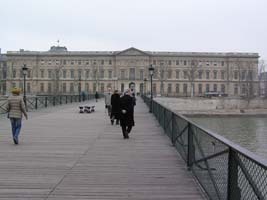 Identifiable are the buildings that form part of the old French royal palace including Sainte Chapelle on the right, the private chapel of the French monarchy. 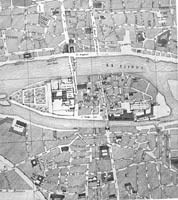 It has been observed that the point of view presented in the miniature corresponds to that from the Hôtel de Nesle, John of Berry's Paris residence (see Google Earth Map). 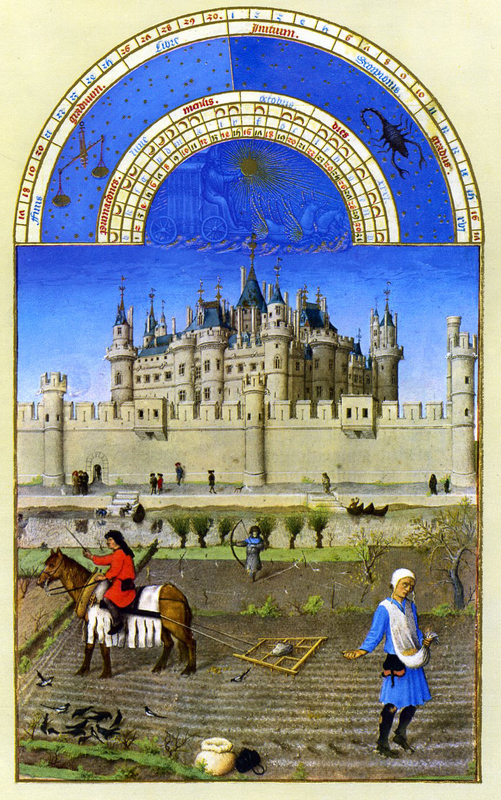 October: In the background of this miniature appears the Louvre, the new royal palace. The Louvre had been constructed as a fortress during the reign of Philippe Auguste, but was transformed by Charles V when he became king in 1364 into his official residence by Raymond du Temple. 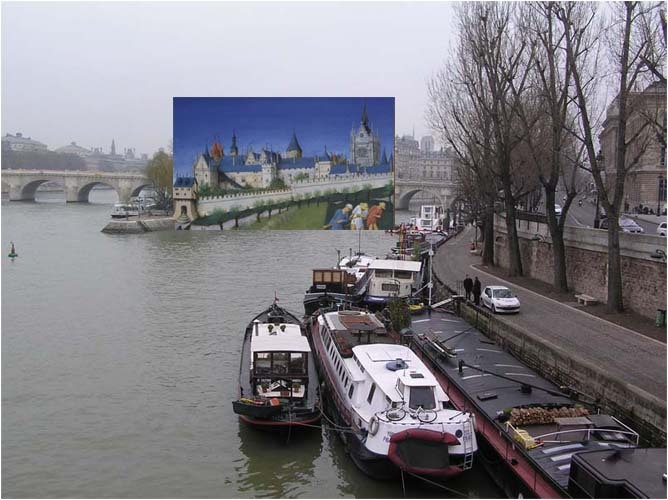 Like the June miniature, the point of view presented in the miniature corresponds to that from the Hôtel de Nesle (see Google Earth map). You might consider the significance of incorporating this perspective in both of these miniatures. Especially consider the ideological and political implications (the photograph on the right shows a model of the 14th century Louvre with the actual foundations in the background). 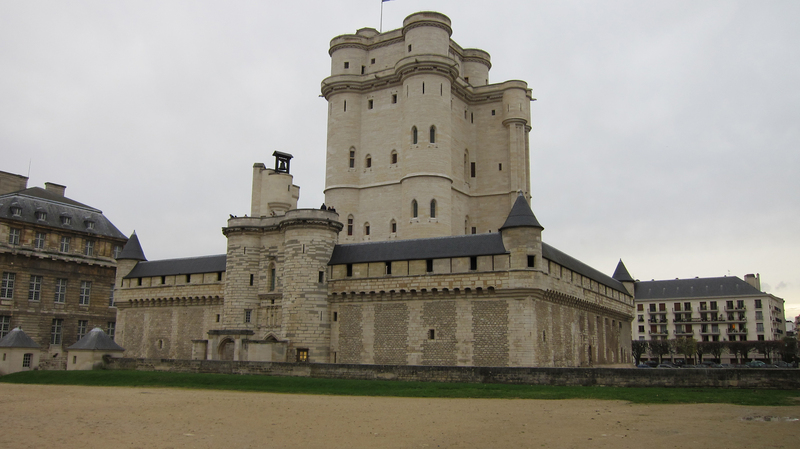 December page: The Chateau of Vincennes is seen in the background. This was the birth place of Jean de Berry. 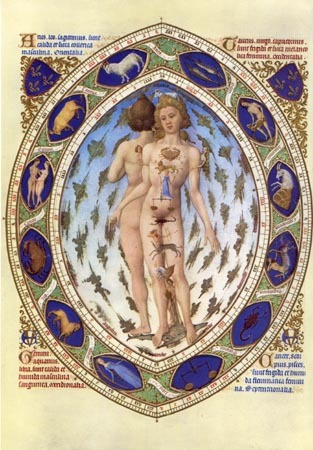 Zodiac Man: At the end of the calendar appears this curious illustration. It shows a man in conjunction with the zodiacal symbols. It demonstrates one of the basic tenets of astrology: how "Man" (sic) the microcosm is controlled by the heavens, the macrocosm. 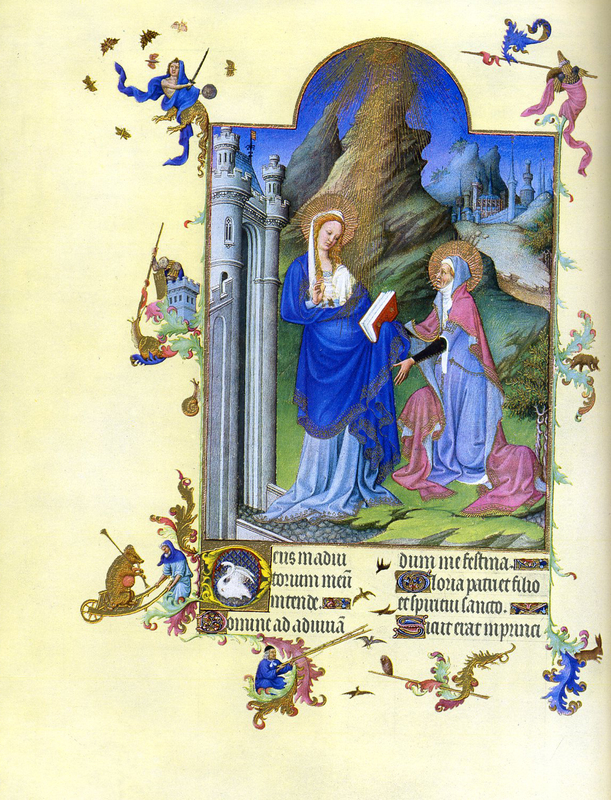 The Hours of the Virgin: The first major text in the manuscript is a group of prayers dedicated to the Virgin Mary. I have included the miniatures of the Annunciation, Visitation, Journey and Adoration of the Magi, and the Coronation of the Virgin. How do these miniatures reflect this culture's conception of the Virgin? 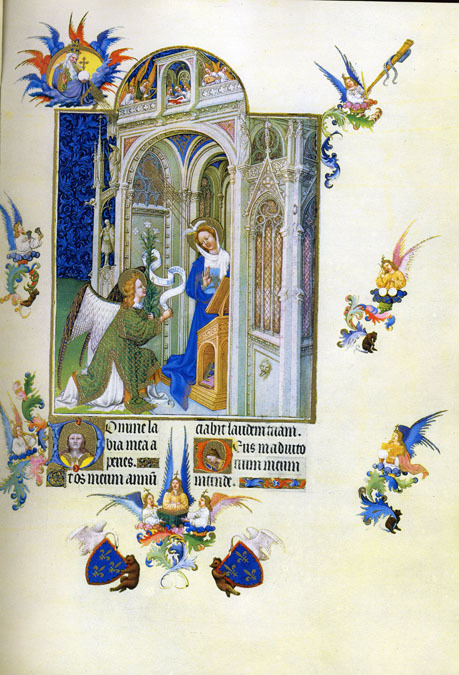 The miniature of the Annunciation is paired on the facing page with an illustration of the Fall of Man including the Temptation and Expulsion from the Garden of Eden. Why would this miniature be paired with the Annunciation? On folio 161v, the miniature illustrating the mass for the first Sunday in Lent represents the Temptation of Christ. While the small figure of Christ being tempted can be seen at the top, the miniature is dominated by one of the Duke's favorite residences the Château de Mehun-sur-Yèvre (see Google Earth Map) . 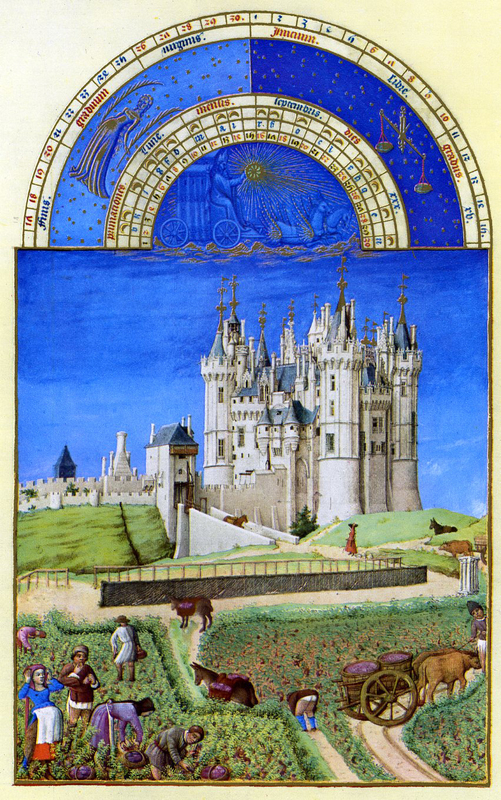 In the upper left corner of the miniature appears a distant view of Bourges. (the spots with yellow markers are especially related to the Limbourgs and the Très riches heures. 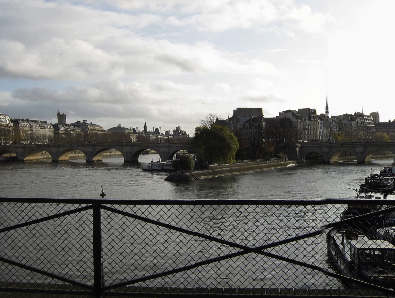 View of the Louvre from the Left Bank across the Pont des Arts. 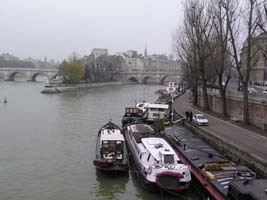 View of the Île de la Cité from the Pont des Arts. View Larger Map The landmarks marked with yellow pins are specifically associated with the Très riches heures and Jean de Berry. Many of the books owned by John of Berry open with an ex libris like the one above. Written and signed by the Duke's secretary Jean Flamel, these inscriptions assertively attest to the Duke's ownership of the particular book. 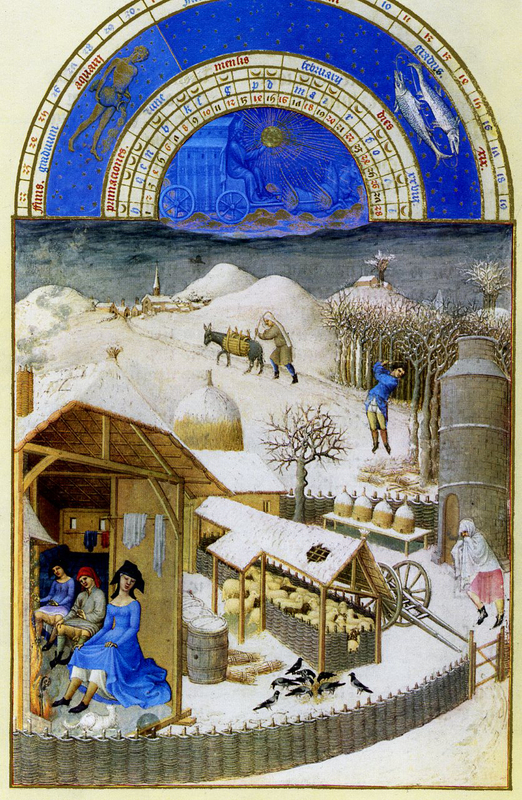 This one comes from the Belles heures, the earlier Book of Hours the Limbourg brothers made for Jean de Berry about 1409. The text reads: "Ces heures fist faire tres excellent et puissant Prince Jehan --filz du Roy de France-- Duc de Berry et Dauvergne Conte de Poitou destampes de Bouloingne et dauvergne. Flamel [This Book of Hours was made at the command of the most excellent and powerful Prince John -- the son of the King of France (John)-- Duke of Berry and of Auvergne, Count of Poitou, of Estampes, of Boulogne, and of Auvergne. Flamel]" Aside from identifying the ownership of the particular book, these ex libris identify John of Berry. 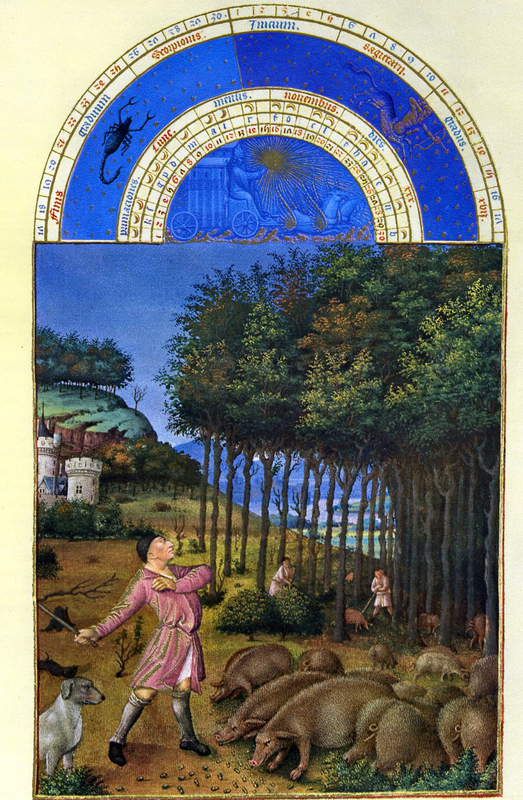 Compare this identification of John of Berry to the calendar pages of the Très riches heures. A.J Gurevich in his book Categories of Medieval Culture begins a chapter entitled "Medieval Attitudes towards Wealth and Labour" with the following statement: "The world-view of any society will include that society's concepts of property, wealth, and labour. These are not only politico-economic categories but also moral and ideological ones; labour and wealth may be highly valued or despised, their role in human affairs can be variously assessed. Economic activity is a component of social practice, of the interaction between man and his environment. It reflects the vital preoccupations of a society, and if we are to penetrate the mental climate of this society it is particularly important for us to try to understand its attitudes to labour and property." 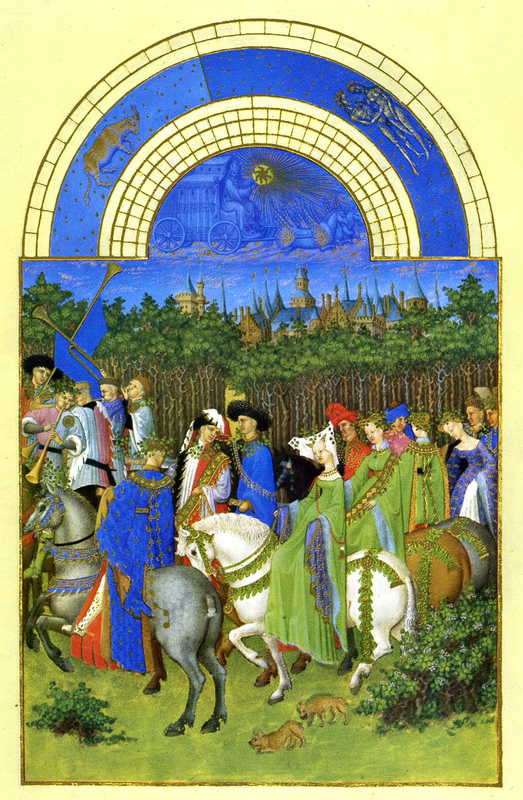 This provides us with a very useful perspective from which to view the Très riches heures. On the basis of your study of the manuscript's Calendar pages and your reading of the Alexander article, try to articulate these attitudes. 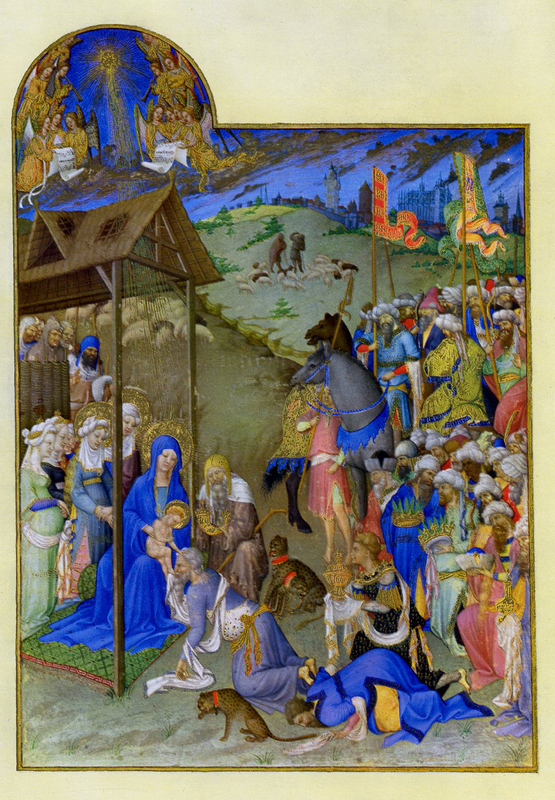 There are two excellent websites that focus on the Très riches heures. There are also good quality reproductions of the Calendar miniatures available over the World Wide Web from the University of Chicago. There is a useful commentary for each of the calendar miniatures. The Vatican site Christus rex has a page that is virtually a complete facsimile of the Très riches heures. 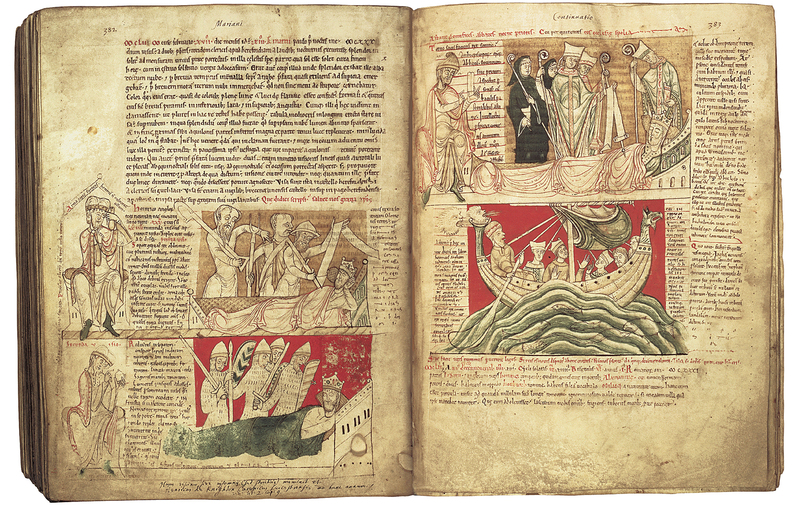 Spend time examining the manuscript through these two sites. Another site describes the calendar. 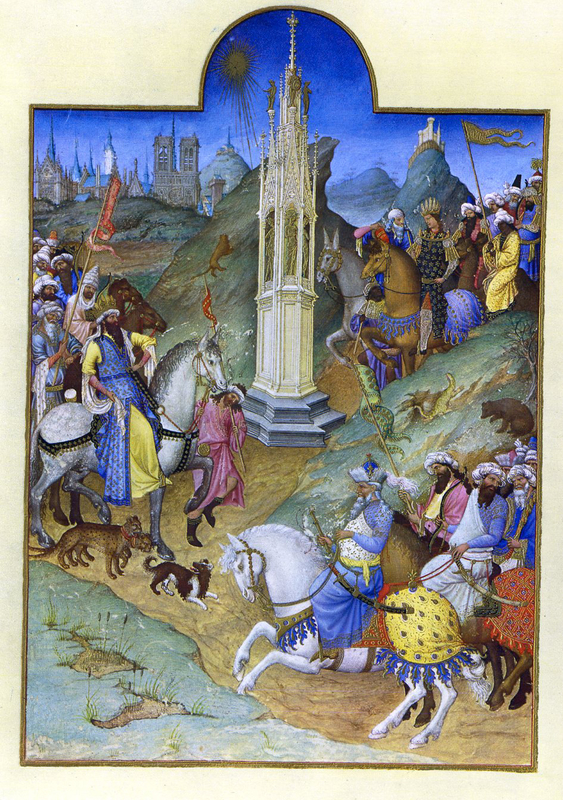 For more images from the Très riches heures. 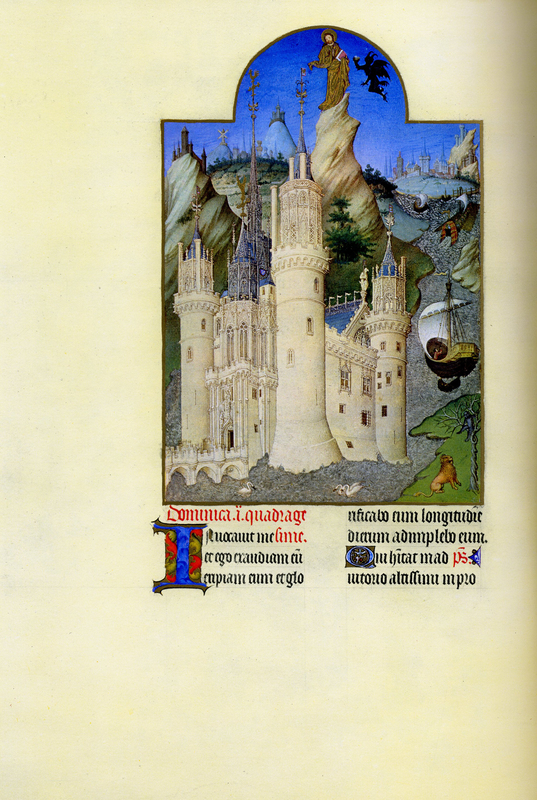 See the video biography of the Limbourg Brothers produced by the Gelderland Media Group. Jonathan Alexander, "Labeur and Paresse : Ideological Representations of Medieval Peasant Labor," Art Bulletin, 72 (1990), pp. 436-452. You are expected to write a three to five page, typewritten essay responding to our seminar discussion. You can focus your discussion on particular aspect of our discussion. For example, you could focus on the representations of women or peasants in the manuscript. Do not feel responsible for covering all the material we discussed, but instead focus your discussion as much as possible. The deadline for submitting your essay will be a week following the completion of the seminar.